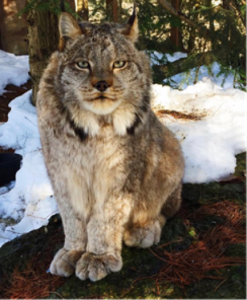 Schnecksville, PA: Zoo staff is saddened to report that Lexy, a Canada lynx and a fixture at the Lehigh Valley Zoo for nearly two decades, has passed away. At nearly 19 years of age, Lexy was the oldest living lynx on record within the American Association of Zoos and Aquariums (AZA) lynx population. The average Canada lynx typically lives into its early to mid-teens. Born May 1, 1999, Lexy arrived at the Lehigh Valley Zoo less than a year later. She was still growing into her gigantic, fluffy paws when she first made the Lehigh Valley her home. In her younger days, Lexy often enjoyed climbing the trees within her habitat to survey guests and birds. As she aged, she became more fond of lounging in the sun alongside her pond and batting at frogs. In her later years, keepers spent a great deal of time developing enrichment items to keep Lexy active and healthy. Lexy first showed signs of illness in January when it was determined that she was suffering from kidney failure, a common illness in geriatric cats. Similar to older domestic cats, the disease is often progressive. A memorial plaque will be placed at Lexy’s enclosure. An announcement regarding its placement will be made soon. The Canada lynx is a medium-sized cat well adapted for life in the northern forests. Compared to the more familiar bobcat, a lynx is larger and has long black ear tufts, a black-tipped tail, and a flared facial ruff. Lynx are usually solitary animals, but will occasionally travel together in small groups. Lynx are located throughout Canada, and in the United States, they are found in northern areas of many states.